UDM Downloads > Wild West Wendy! 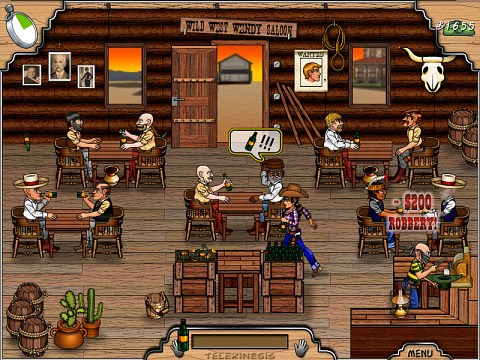 Conquer the Wild West with your saloon franchise! Serve drinks! Capture criminals! Return missing cows! Live the Wild West through 9 beautiful scenarios, over 35 cartoons, and over a hundred news from the town's newspaper. All the excitement of the Wild West awaits you in this action-packed game for the whole family! Feel the Thrill of the Wild West! Did you think bartending in the Wild West was easy? Think again! Help Wendy in her journey from naive barwoman to Saloon business expert, and settle an old score in the process. Wendy will have to endure the constant harrassment from thieves, the danger of escaped criminals stopping at her saloon for a couple of drinks, the usual mess caused by bar fights, and find the truth behind the most weird characters to ever walk the Wild West - is the town's undertaker a vampire? Did that guy drink invisible ink or is he a ghost? Sounds like too much? Don't worry - Wendy will make new friends and loyal allies to help in her quest to win the Wager of the Century against an evil rancher! Beautiful hand-drawn art and specially composed modern-country music tell this classic Western story with a lot of humor; but remember, the fate of Wendy is in your hands! Wild West Wendy Features... * Complete tutorial - become an expert in no time! * Adjust the game difficulty at will (easy, medium or hard) * Nine beautiful and detailed scenarios * Many fun characters straight from the Westerns! * Three different play modes (Story Mode, Campaign Mode, and Time Attack) * Online High Score table - Compete with players all over the world! * Over 35 cartoons telling Wendy's struggle against the evil Hank! * Works fine in older computers!